One of the many people I got a chance to meet at BarCampUKGovWeb this Saturday was David Wilcox. It was through David's work on Useful Games that I first started thinking about the role games have to play in participation and consultation. And so, with the challenge of creating an online consultation to engage young people in thinking about the different training needs of leaders and managers in the youth workforce – I was drawn to thinking about how approaching the consultation as a 'game' could help us get good quality consultation responses without falling back on a long-and-boring e-surveys that would ask people to rank abstract attributes of leaders and managers, and to choose which detailed training packages 'managers in general' might need. 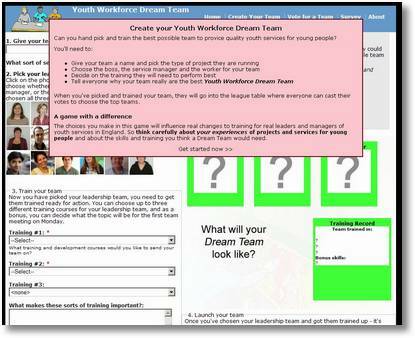 So I built an interactive consultation game called Youth Workforce Dream Team – and it's online now. The game is targetted at young people but responses from all ages are welcome – and if you work with any groups of young people who may be interested in adding their responses, please do share the link, or download and share the attached flyer. The 'rules' of a game can offer a lot of information, and by creating interactivity and incentives games can provide a powerful way of collecting structured information from players, without asking players to force their responses into overly formal structured forms. 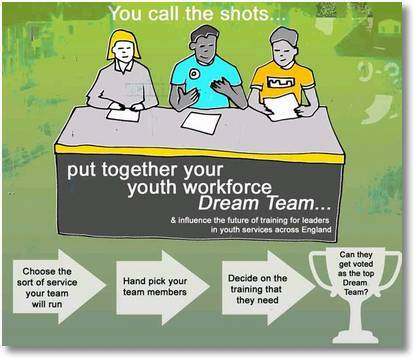 And whilst the Youth Workforce Dream Team game doesn't quite have the flashy cartoon graphics of a DemGame from Delib, in being built since the New Year on top of Drupal, and in having the flexibility for us to respond to feedback and adapt it throughout it's short lifespan (the consultation runs until the 18th February 2008), it should help gather some really useful responses to influence the future of leadership and management training of youth services in England. I'm also interested to hear about any experience readers may have had in using games for consultation. Either online or in physical spaces. Have you designed games to engage young people in consultations and decision making? What works well? What issues are there to look out for? Previous Previous post: Social Media ROI: Are we comparing like with like?